We are a Registered and Accredited Paddleboarding School offering instruction at all levels, delivered by professional instructors and tailored to your exact requirements. New to the sport? You've come to the right place. We will start you off on the right equipment for your size, age and fitness, which will make it as easy as possible for you. Indeed, we'll go as far as to say that you are almost certainly going to stay dry. Yep, that's right. You won't need to put on a wetsuit, or worry about getting wet. You'll be on a board that is so stable that all you'll need to do is enjoy yourself. Those are our primary goals for your first session, that you finish dry, and with a big smile, keen to get out for some more. Better still - after your lesson you can come down to Paddle at the Pear Tree on any subsequent Thursday night, grab a board and go put your new-found skills into practice, absolutely free!. This is included in the price. Beginner sessions can be up to 5 in a group. The format for a beginner lesson is simple. Starting off on dry land, we familiarise you with the paddling and turning techniques, and that all-important first stand-up. Once we're confident that you've got the hang of it, we all get out onto the water, and paddle around for a while in the kneeling position (we call it the 'safe position'), until you're comfortable with paddling, turning and generally being on a board. Then we'll get you up into the stand-up position, and head off for a cruise. The session will normally last about 80-90 minutes all up. "we guarantee that you will be standing up and paddling in your first session!" The lesson will take place at the most sheltered, safe piece of water we can find for you. There will be no waves or surf to put you off or make it harder. We guarantee that you will be standing up and paddling in that first session. You may think you have dreadful balance, or are not fit enough to manage it, but the truth is that if you can stand up, you can stand-up paddleboard. We have taught literally thousands of people over the past decade, and have a huge repertoire of tricks and techniques up our sleeve. Not once have we not been able to get someone up and going (and this includes some quite severely disabled or handicapped clients). Clothing: On the board, a rash top or teeshirt to keep off the sun, and a pair of shorts is ideal. Tracksuit pants or leggings are OK but you'll probably get the ankles wet. Please note that you must have some sort of upper body covering, even in high summer. Feet: Off season, then if you have any wetsuit boots or shoes it will definitely keep your feet warm. They are the only part of you that is likely to get wet. If you don't have wetsuit boots and wish to wear trainers that's fine. Wetsuits? Really not necessary - you'll overheat, and they soon start to chafe. Sun protection: A sunhat and sunglasses is well worth having too. We strongly recommend applying sun cream to all exposed areas of skin before the lesson. Prescription glasses? If you need to wear glasses please ensure you have a SpecSaver or something similar to secure them. Change of clothes and a towel: Just in case you do fall in, or decide to take a swim to cool off at the end of the session! Buoyancy AidsEach client will be equipped with a belt-pack style PFD, for use in emergencies only. If you have a PFD that you are comfortable wearing then please feel free to bring it along - particularly if you prefer to have the reassurance of permanent extra buoyancy should you fall in. Your sense of adventure: Vital. You're going to have a fantastic time! Between one and five students for a beginner session. If you would rather not be put in a group with people you don't know, then just let us know when you make your booking. Can you cater for families? No problem at all. We have boards to fit all shapes and sizes of client! However, we have found that children much younger than 8 should probably have their own lesson, rather than as part of a family group, as otherwise their slower pace will hold everyone else back. If you are intending to get into paddleboarding as a sport then we'd certainly recommend very strongly that you are able to swim. However, it needn't stop you having a paddleboard lesson. Please advise us if this is your situation, and we will almost certainly make the lesson a one-to-one (ie just you and the instructor) so that they can be close to you at all times, and keep in shallow water close to the shore. You will of course need to wear a permanent-flotation buoyancy aid, and we will put you on a nice wide stable board, to make it as easy as possible for you. What is the youngest age you can teach? Youngsters as young as 6 can learn to paddleboard. However, we have found that children much younger than 8 should probably have their own lesson, rather than as part of a family group, as otherwise their slower pace will hold everyone else back. I have a disability/medical condition. Can I still learn? Yes, absolutely. Please contact us to discuss your particular situation, and we will work out a plan to get you into the water. It will almost certainly be a one-to-one lesson (ie just you and the instructor) so that they can give you their undivided attention at all times. We have super stable wide boards, to make it as easy as possible for you, and are currently working with the Halberg Trust and Surfing for the Disabled on the design of special paddleboards specifically for this role. Will I get wet or cold? 99% of our beginner clients don't get wet. (100% in the last 3 years, as our teaching techniques continue to improve). There is no need to get wet, paddleboarding is not innately a falling-in sport, unless you are in surf or white water. We use extra-stable beginner boards for your first session to make it as easy as possible for you. So hopefully, all that will get wet is your feet. As for cold, paddleboarding does generate a lot of upper body heat, so you actually don't tend to get cold. If it's a cool day then the best plan is to wear layers, so you can start warm, but easily shed a layer or two as you warm up. Why do I even need lessons, it looks really easy? While paddling may appear straightforward, there are numerous potential bad habits and technique mistakes which will decrease your efficiency and quite possibly lead to injury. So, starting out with a lesson or two from a qualified instructor, on equipment specifically designed to make the early sessions as productive and painless as possible, is a very wise plan, particularly if you don't have much experience at watersports, are suffering from any injuries or disabilities, or maybe just aren't feeling too fit at the moment. The learning curve will be far steeper, you can leave all the worrying about safety and weather conditions etc to your instructor, and you'll not be picking up any those bad habits (which, once engrained into your technique, are often very hard to shift). Better still, as there isn't any one 'right' way of paddling (just as there isn't one right way of walking, running, or any other repetitive motion activity), a good instructor will be able to equip you with the right techniques for you – taking into account your bodyweight, shape, height, age and fitness level. And then, having seen what works best for you, give you good advice on what equipment you should be considering for your first purchase. Yes. If you don't sign the waiver, we can't take you on the water. However, the waiver process is just as much to protect you as it is us. It ensures and acknowledges that we've asked you all the right questions and both you and us have all the necessary information to ensure that all safety issues are covered. Pretty much anything goes. We can take cash, eftpos and credit cards at the time (as long as the chosen venue has a 3G connection. Otherwise it's cash only). Bank transfer, PAYPAL and Bartercard payment can also be taken, as long as the payment is completed and cleared before the lesson. What sort of equipment will we use? 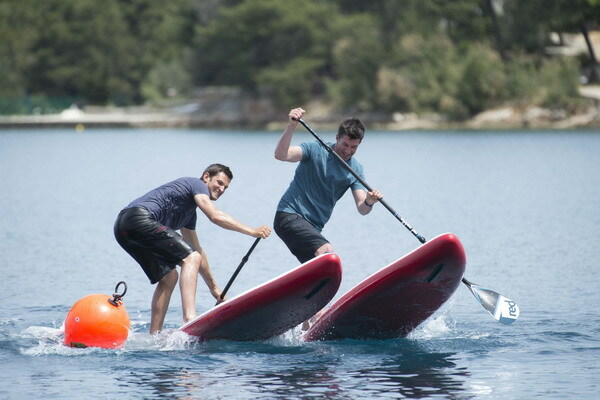 To start with, you'll be on the world's best inflatable paddleboards, the Red Paddle Co Ride range (which comes in various shapes and sizes so that we can match you to the best one for your requirements). You won't know that you're on an inflatable board, they're rock hard, and perform as well (or better) than most solid boards. But they're very forgiving if you do happen to fall, so you won't come home with bruises or knocks. And from our point of view they're exceptionally durable, so if you do happen to bump into a rock or boat or submerged object, we won't be worrying!. Your paddle will be a lightweight fiberglass adjustable length paddle, that we can set to exactly the right length for your stature. The blade size will also be determined by your build. Your first lesson is primarily just about getting you used to being on a board and paddling it - our main goal is simply to ensure that you have a great time and enjoy yourself. Your brain is not yet ready to take on the challenges of fine tuning your paddling stroke, let alone tackling the challenges of the multitude of stances and turning techniques that the competent paddleboarder needs to know. The paddle stroke is actually a very complex manouevre, and there isn't any one 'right' way to do it (just as there isn't one right way of walking, running, or any other repetitive motion activity). However, if you try and teach yourself you will almost certainly pick up bad habits and incorrect techniques. This is why it is so worthwhile taking some intermediate lessons, where your instructor will be able to fine tune your paddling technique to match your bodyweight, shape, height, age and fitness level. Other important improver techniques include turning, stances, bracing and steering strokes, understanding board and paddle design, and understanding your environment (water and weather awareness). If you are new to watersports then a few of these improver sessions will equip you with a wealth of vital knowledge that could one day save your life! If you're looking to get into racing or surfing then again, it is vital that you are doing the basics right. Or indeed, if you are already racing or surfing, and looking to improve your performance - come and see us. Every successful athlete needs coaching - you can't do it on your own. We can help you - we have coached SUP racers to podium level at the National Championships! We generally find that intermediate sessions last about an hour, as after that there's danger of brain overload! However, if you really want to give it your all, then do check out our BIG DAY OF SUP courses, a full day of paddleboarding learning and fun. Intermediate sessions can be up to 3 in a group, if all the clients are of similar ability and have similar goals. Absolutely! However, if your plan is to have lessons so as to get into a new aspect of the sport (ie racing or surfing), we'd strongly suggest not buying a board for that until you have had a few lessons. We can supply appropriate gear, and most importantly, we can advise you as to what will be the right type of board for your requirements. Where will the lessons be? Initialy, we'll start on flat water, so we can assess your paddling without the distractions of dealing with chop or surf. From then on we'll use locations that provide conditions appropriate for the lesson. At some point, yes. Particularly if you are looking to get into surfing, then falling off, dealing with the board in the water and getting back on again quickly and efficiently will be absolutely vital. However, we can usually schedule getting-wet lessons in advance, so you can bring a wetsuit or specific clothing for those sessions. SUP Racing is great fun, and an excellent fitness workout. You burn more calories when SUP racing than doing virtually any other sport. There are regular SUP races happening around Northland; very informal gatherings happening every week and attracting many dozens of participants, young and old, fit and unfit, male and female, all just there to have a good enjoyable paddle and burn off some cobwebs, office frustrations, and see if they can improve on last week's time. 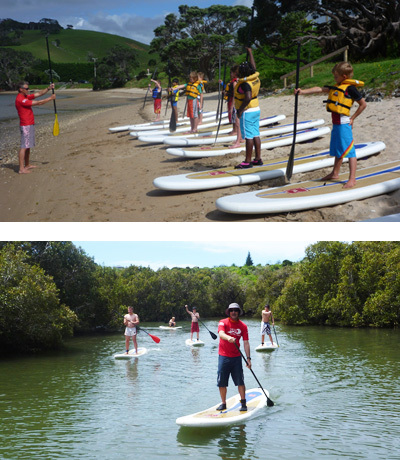 For us here in the Bay of Islands, we have the Pear Tree paddle series every thursday at Kerikeri Basin. More info here.... We also run a weekly squad session for the regular racers on Tuesday mornings. IF this sounds like your sort of thing then come along and join in the Paddle at the Pear tree racing on Thursdays, and talk to us about joining the squad! And then there are the SUP Nationals - a fabulous day/weekend out down at Omaha Beach in February, with races for all abilities, vast numbers of spot prizes, great goody-bags and the chance to be on the same startline as world champions. If you can paddle more than a kilometre you can enter, everyone is welcome, and really - how often do you get chance to compete in a National Championships? However, SUP racing really finds out your technique. If you are not paddling efficiently, then you are not going to go fast, or you'll just tire yourself out. So if you fancy giving racing a go, or simply want to improve your paddling technique and go faster, more efficiently, then book a race training improver session now! What we cover: Paddling technique, starting technique, pacing, drafting, race turning, tactics and strategy, fitness, choosing equipment. All race equipment (high performance boards and paddles) are provided, appropriate to your ability. Initially, we strongly recommend 1:1 sessions for race training, so the instructor can give you their undivided attention and identify exactly what needs to be worked on. For subsequent sessions, it is good to have more people on the water so as to create a more competitive atmosphere and simulate certain race situations. SUP Surfing is fabulous fun. However, this too really does require having your fundamental paddling techniques just right. If you're not already an experienced surfer then there are a whole lot of things you need to know and understand about the way surf and surfing works, before you paddle out into any line-up. 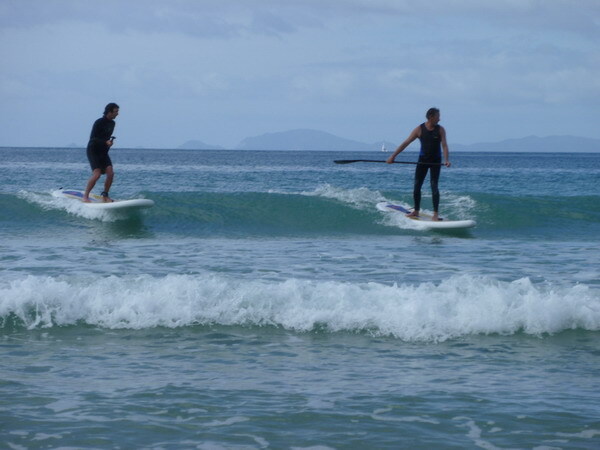 Over the years, Northland Paddleboarding has developed and pioneered an innovative approach to teaching SUP surfing, using flat water drills to teach the essential skills you will need in order to have a successful surfing session. They work so well that almost invariably now, when we take a client out for their first go in the real stuff, they successfully catch and ride a wave on their very first attempt! So, if you're keen to get into SUP surfing, then call us and book an improver session. If we think you're ready for SUP surfing then we can put you through our flat water preparation and education programme (which normally only takes two sessions max), and then, when the conditions are right (ie a small, safe but rideable wave) we'll get you out there and riding! What we cover: Paddling technique, how to get out through the surf, how to position yourself in the line-up, how to catch a wave, how to ride a wave, how to finish the ride, understanding the surf zone, surfing etiquette, how to fall and how to recover from a fall (in the surf), surfing hazards, safety considerations. All surf equipment (boards and paddles) are provided, appropriate to your ability. We strongly recommend 1:1 sessions for surf training, so the instructor can give you their undivided attention and identify exactly what needs to be worked on. However, larger groups can be catered for if necessary and by special appointment. The cost for these will need to factor in the extra time and transportation costs, and will vary from location to location. Already an experienced paddleboarder and just want to get a guided tour of some of the hidden gems and waterways around the Kerikeri area? Give us a call and we'll be more than happy to tailor a tour to your requirements, ability and stamina levels. Use your own boards, or we can provide them. 90 people drowned in New Zealand waters in 2014 - a terrible statistic. But, if you were out there on your paddleboard (or on the beach), and you saw someone in the water who looks to be in trouble, would you know what to do??? Would you be able to rescue that person? Could you get them onto your board (if that's the appropriate option) and back to shore? And you should. Every paddleboarder should know these skills. So here's your chance. The Northland Paddleboarding SUP SAFETY course takes just a couple of hours, starting in the class room to cover the essential theory, and then onto the water so that you can learn, experience & practise the drills & rescue techniques for yourself. We need a minimum of 3 and a maximum of 6 to run the course. The course costs $150, so if there's 3 of you that's $50 each, if 6 then it's just $25 each - an absolute bargain. It's a fun course too, you'll really enjoy it and feel very empowered with the knowledge and skills you get from it. So - find some friends and sign up now! Back by special demand, our super-fun full day of SUP for intermediates and improvers. a 6-7 hour session of practical, theory and fun, that will lift your SUP game to the next level and equip you with a whole lot of potentially life-saving (yours and others!) knowledge. The day starts with a warm-up paddle, where we assess your existing ability and identify some work-ons. Then it's ashore for some theory and shore-based practise, working on isolating and improving the areas of your technique that need some attention. Then it's back on the water for some more paddling, where we put into practise what we've been working on. Ashore for a snack, coffee and a chat about SUP safety, discussing the various problem scenarios that you might find yourself facing. Back onto the water for another paddle - this time a nice cruise, but all the time we'll be tickling away at those technique issues, and talking about the safety issues too. Ashore for lunch, and then it's time for the real fun stuff. We do the full SUP Rescue course, as detailed above. Everything you need to know on what to do if ever you encounter someone in trouble (whether you have your SUP board to hand or not). It starts in the class room, and finishes in the water, with some real life rescue practise. It's a brilliant few hours, you'll learn loads, and you'll go away feeling incredibly empowered. You do not need to be super fit or blessed with amazing stamina to complete this day, there is plenty of onshore time to recover. It is not meant to be a 'boot camp'. Nevertheless, it's certainly a very full day, and you'll be exhausted at the end of it, but your SUP skills will be several rungs further up the ladder, and you'll have knowledge and skills you never imagined you could possess. Northland Paddleboarding is the only SUP School in the country that offers this course, so don't miss out on this opportunity. Sign up now! The cost is just $150 per person, minimum 2 people, maximum 5.